@ClydeMandelin I posted a link to the Mother 3 translation page on Miiverse, and got a warning that it was related to "criminal activity". Apparently this isn’t just a MOTHER 3-only thing, though; something similar supposedly occurs if you post about Project M, a popular mod for Smash Bros. Brawl. I’m told that even sometimes just mentioning it as “PM” can get you in trouble, which is a little silly and bothersome when you want to use PM as an abbreviation for something else, like Paper Mario, for instance. Anyway, just watch out – even if you mean well, don’t get yourself banned from Miiverse by linking to the MOTHER 3 translation! You don’t think Nintendo would take it down do you? 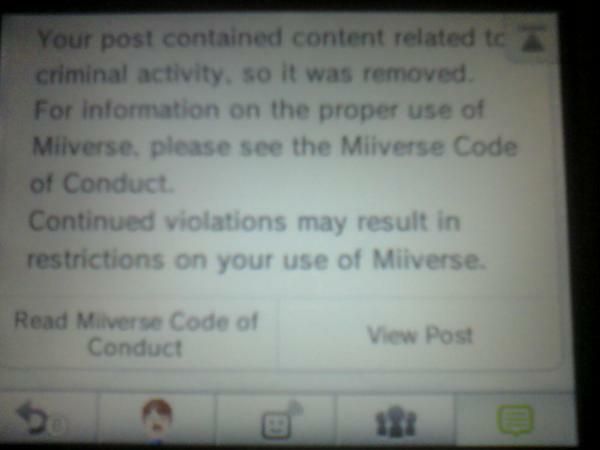 Posting links is against the Miiverse Code of Conduct, so it might be just that. Well, it says it’s related to “criminal activity” so it’s probably the linking rule + the URL is possibly on a blacklist of some sort. Criminal activity?? Wow, that’s downright offensive. I thought Nintendo was OK with the fan translation as long as it wasn’t sold? Hopefully this is just an over zealous Miiverse mod. Once I posted a link to Password Generator for Zelda Oracle games (http://www.zeldadungeon.net/Zelda07Password.php) and it was removed for the same reason. It can be used to get Advance Rings on 3DS versions, because the Advance Shops are closed. I’ve seen more Miivese posts mentioning Mother 3 Fan Translation, but none of them had links to your website. However, Project M is a different story. Even posts without links gets deleted. Either there is a group of people constantly reporting these posts or hidden “auto-reporting” feature. That’s so stupid. I mean, I understand it can be related to “criminal activity,” but it’s Nintendo’s fault for not translating the game themselves despite the demand for it. You are a criminal mastermind. I could imagine Nintendo’s next dumb move – showing glitches will be against the Code of Conduct. Especially these ones related to sequence breaking, like accessing levels of obtaining items too early. I remember I once quoted something from Homestar Runner that contained a fake URL, and it was deleted for “advertising”. And moderations never leave you’re account; it’s still there, over two years later. Isn’t it such utopian plutocracy not the real democracy? Mr.Miyamoto?I almoust had ban on Miiverse.I had for 4 warnings instead of 6. Many things Nintendo’s doing lately are literally grossing me out, this is just one of them. Criminal activity? Really? The real lesson here is that adults shouldn’t be spending their time on Miiverse. God, Nintendo is getting harder to support, especially when they refuse to release games with such high demand. You’re a wanted man, Tomato. Let’s all calm down here, Nintendo’s got every reason to take this stance. Remember, this isn’t really a “free speech” zone, it’s a moderated forum created by Nintendo. As such, they’ve got to make sure that it isn’t used in a way that could hurt the company or send the wrong message to their users. Now, I imported Mother 3. I am using a flash cart, and I ripped my own copy of the GBA BIOS using a tool on said flash cart. I’m doing all of this to stay legal and support Nintendo in whatever way I can. As a result, when I play the game, as far as I’m concerned it’s legal, and I advise other fans to at least import the original game if they possibly can for the same reason. However, that doesn’t change the fact that this is ALL outside Nintendo’s purview. The simple fact is, for most people the only way to make this work involves downloading the ROM from “places” and using an emulator with a downloaded copy of the GBA BIOS. Nintendo CAN’T encourage that sort of behavior, because they’re encouraging theft. The fact that they’ve turned a blind eye to this site is really a blessing on our part. While technically all this site does is host a patch, Nintendo is well within their rights and has a legal basis for saying this encourages piracy. Some of you are too young to remember, but in the late 90’s, there was a Playstation emulator called “Bleem”. It was the most accurate emulator at the time, and it was “legal” in the sense that it was the ONLY emulator out there that didn’t require the Playstation BIOS to work (they reverse engineered and programmed their own alternative to the BIOS to get around this legal hassle). They even SOLD this emulator, in stores and through the mail, and eventually ported it to the Dreamcast. Sony however sued them into oblivion anyway. Sony didn’t actually win the lawsuits, but they didn’t need to. All they needed to do was force Bleem to defend themselves in court until they were bankrupted from legal fees. The lesson here? Don’t tempt fate. Fate will not be tempted! God will not be mocked! Seriously though, let it be. Nintendo doesn’t want to have their users “promoting” things like this. They’re happy enough to let us have our fan patch, but it must always remain completely disassociated with Nintendo themselves. Nintendo must, essentially, pretend they’ve never even heard of this fan translation. They have every reason to keep this priority, so let’s go ahead and honor it just out of courtesy. If anyone wants to find out about it, there’s plenty of ways to do so, but Nintendo can’t be the ones to reveal it (even if indirectly from a post on their forums). If Nintendo shuts down Mother 4 like Square-Enix did with the Chrono fan projects, I’ll cry. If mother 4 ever gets taken down or if the mother 3 English translation over something like legal issues I will cry. Also if you look in the right places you can still get the chrono fan projects. Must I use Tor to find a fan project? There’s no need to worry about Mother 4. There’s already tons of Nintendo fangames, why would they care about Mother 4? There’s even less reason to worry about the Mother 3 translation. I’m sure Nintendo know about it for a long time, and they would have taken it down years ago if they wanted. If they decide to suddenly take it down someday, it would be for a good reason. The kind of good reason that we all have waited for a long time. They would probably order a cease and desist on the translation distribution if they wanted to translate and release it themselves. If they really cared about it that much, why has it gone untouched for this long? They obviously wouldn’t want the competition with free distribution and take it down then, but they don’t care about it ATM because they don’t want to release it in NA and Europe. Mother 4, on the other hand, isn’t an official game, so they’re not breaking any copyright laws by not reusing assets or copying anything because the real Mother 4 doesn’t exist. Maybe they could get C&D’d over the reused music, but that’s unlikely. In response to the question about using a tor. possibly but I found crimson echoes without using a tor. good luck. Also I am starting to see this trending on Facebook on my news feed with links to gamnisia talking about this. If it gets too popular I fear they may order a cease and desist and still not release it. Well here is hoping that doesn’t occur unless they do release along with mother 1 but maybe that is asking too much. I disagree that using a rom is fully illegal. Blame the asshat and moneylenders behind the current EU copyright law, as well as the US DMCA. If these laws can’t be revamped to be more fair they should be taken down, and US copyright law reverted to pre-october 1998 levels. The main driving force behind most of the prevailing western Copyright laws is GREED and caring more for money than fairness. I bet EarthBound 64 is “real” MOTHER 4.Currently I have no plans for MOTHER 1 prequel,but it’s documentary 3D jRPG game about exploring haunted and abandoned places in planet Earth. Not sure where, I’ve got a lot of issues with the DMCA. Did you know part of that act applies to copyrights on ship designs? Like, boats I mean. However, the DMCA shouldn’t be entirely repealed because of a single part of it, the “safe harbor” provisions. Without that, Youtube itself would have been taken offline, as would any online forum that hosted copyrighted content. The safe harbor provision is the only thing that prevents “hosting” sites from being shut down. The flip side is that it only provides this protection so long as these sites comply with takedown requests. On paper, takedown requests need to have some legal support, but in practice sites like Youtube just can’t afford to check out the legal basis for each and every takedown notice, so they simply comply with ALL of them and take a “guilty until proven innocent” stance after the fact. They can hardly be blamed for that, considering the consequences for even one failure to comply with a legitimate takedown notice. I wasn’t trying to stand up for the DMCA, I was trying to stand up for Nintendo specifically. Namely, the BEST you can reasonably hope for from Nintendo is for them to turn a blind eye to this fan translation. If they did anything more, and allowing people to discuss and link to it would count as “support”, legally they could forfeit their own copyright for failure to protect. We’re discussing it right here. 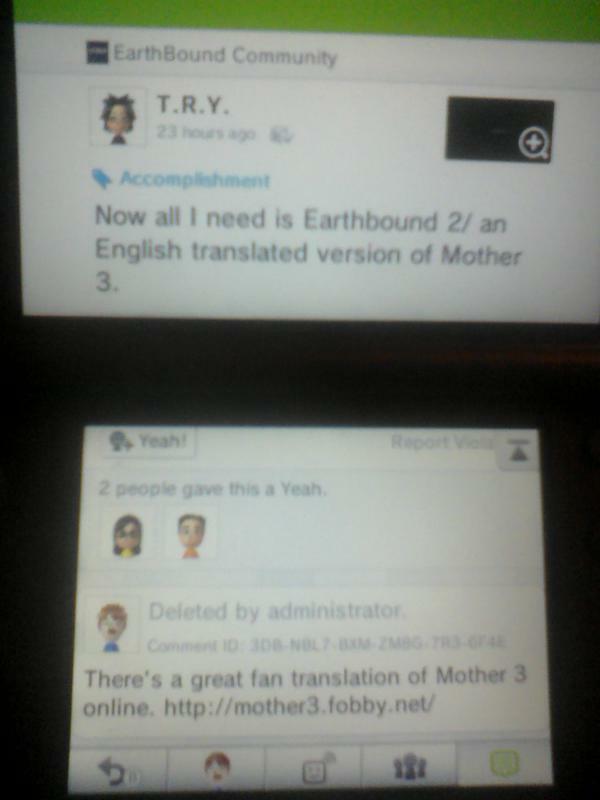 Does that mean many that only post on the Miiverse and don’t know about this fan translation are going to miss out? Yes, of course it does. However, you MUST see Nintendo’s position here. Oh, as for Mother 4, I suspect that ultimately they’ll need to change the name of the project. A similar thing happened with the “Silver Lining” fan sequel to the King’s Quest series. It was originally going to be called “King’s Quest 9: The Silver Lining” (among a few other alternate names) but they were given a cease and desist letter from Activision (the current owners of Sierra’s franchises). The deal they made, since Activision saw the sort of hate that comes when a company shuts down a fan project, was to allow them to make it only if they changed the name so that no one was mislead into thinking it was an official sequel, thus confusing consumers if/when an actual sequel came out. In either case, since it was set in the same universe as the King’s Quest games, they never intended to actually make a profit off the fan game. So, I’d say that’s probably the best move Nintendo could make regarding “Mother 4”. In fact, I’d say the project makers would do well to preempt that and change the name themselves. Gosh darn it. There’s nothing criminal about rom hacks. It’s the sharing of roms that’s illegal. Why MOTHER 3 for SNES hack rom is title screen malfunctioning? Esper, I agree fully. The wording of Nintendo’s takedown notice could have been better, but it doesn’t change anything. Nintendo simply CAN’T promote an unofficial hack that can only be used on ROMs. It’s the same reason they have to take down links to Lunar, the Super Mario World level editor. Honestly anyone who is saying Nintendo is “wrong” for doing this just dont understand. Promoting ROMS on Nintendo’s own forums are against the rules. Its even written in the FAQ. He literally promoted a pirated game. Even POSTED LINKS TO IT. I’m not sayin’ Nintendo’s wrong! Please do some research first. The fan translation is not a ROM. It is a patch for ones, and the link leads to that patch’s site. That site urges users to legally import MOTHER 3 and rip the ROM themselves. Nobody promoted anything remotely pirated. And Nintendo doesn’t approve things such as ripping a ROM from a cartridge and modifying its content.